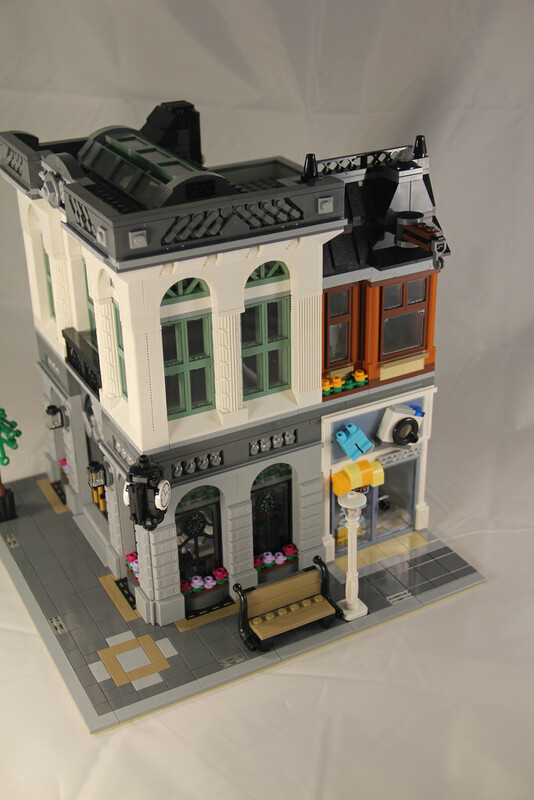 ​Time for the first review of 2017, and we’re starting big, with 2016’s Modular! I’m a bit behind the eight ball with this one, but I’ll try my best to get my hands on the newest addition – 10255: Assembly Square. In the meantime, let’s take a look at the Brick Bank. 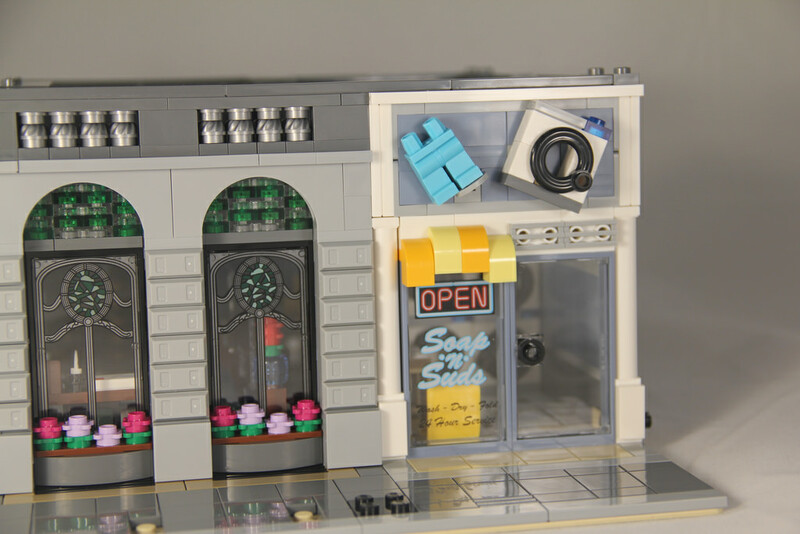 The Brick Bank is the fourth corner building to appear, meaning that if you have the entire collection, going back to 2007’s 10190: Market Street, you can have yourself an entire city block with some room in the middle. It was inevitable that 2016 saw a corner modular being released, as it’s happened every third year. Cafe Corner in 2007, Grand Emporium in 2010, Palace Cinema in 2013, and this one. 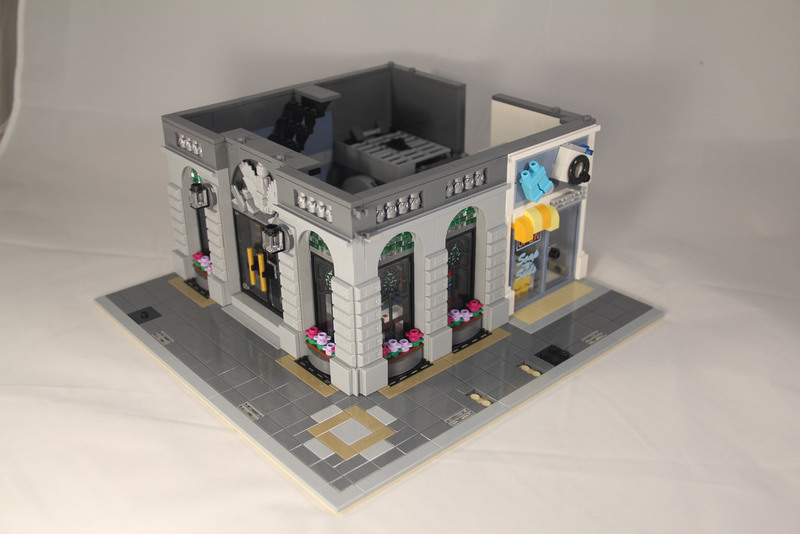 Not only is this build a very stylish bank, but there’s also a laundromat, where customers can sneakily launder money through a special washing machine. It’s a very clever idea, if not a bit naughty! Inside the box is the instruction booklet, a 32×32 tan baseplate, and 20 numbered parts bags. 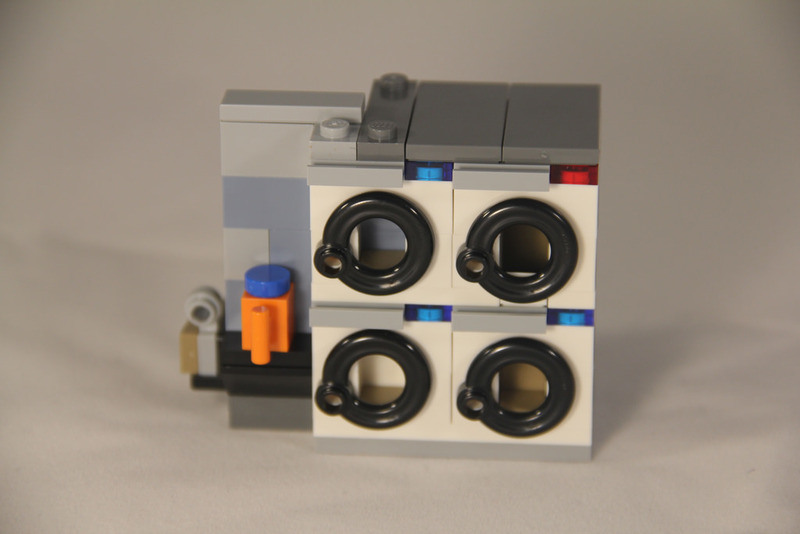 This set, like many of the other modulars that have come before it, has introduced loads of new elements. Some are re-colours, some are entirely new moulds. I’m not going to go through all of them of course, you can take a look at that yourself, but I will go through a few of my favourites, and a few surprises! Before I delve into that, let’s take a look at the minifigures. There’s five in this set, and the combinations of elements are all unique as well. There’s the Bank Teller, the Bank Manager, Bank Secretary, the prize-winning child, and the mum, who also doubles as a bank robber. Three of the torsos have never been seen before, from the mum, child, and secretary, and the mum’s legs have had a recolour. The teller’s hair is also unique colour-wise. Each of the minifigures is a good inclusion, with some extra thought going into the robber side of the story. The printing is very nice, it’s vibrant, and makes for some fun play elements, which I’ll get into later.Ok, the parts! Let’s first take a look at the two new moulds. There’s the flat tile 2×3 with angle, otherwise known as the Nexo Knights shield part, as it appears quite heavily in the Nexo Knights theme. It’s used in this set to create some rather striking tiling on the floor. Then there’s the 1x2x1 2/3 with four studs on the side used for the detailing on the exterior walls. There’s plenty of these in the set, and they are sure to come in handy in many other ways. Getting a new SNOT brick is always exciting! There are also some recoloured elements, with the light stone grey bullion, used in the detailing of the exterior. There are 42 of these in the set. There’s also the recoloured iron fence. This one has also appeared in a couple of Elves sets from 2016 as well. Lastly there are new printed elements. There’s the beautiful stained glass and iron wrought windows, the Soap’n’Suds laundromat window, the 500 stud novelty cheque, and what appears to be possibly a portrait the father of the bank manager, looking very stern in his office. The build starts with bags numbered 1 and 2, and the most amount of tiling I’ve seen on a modular. 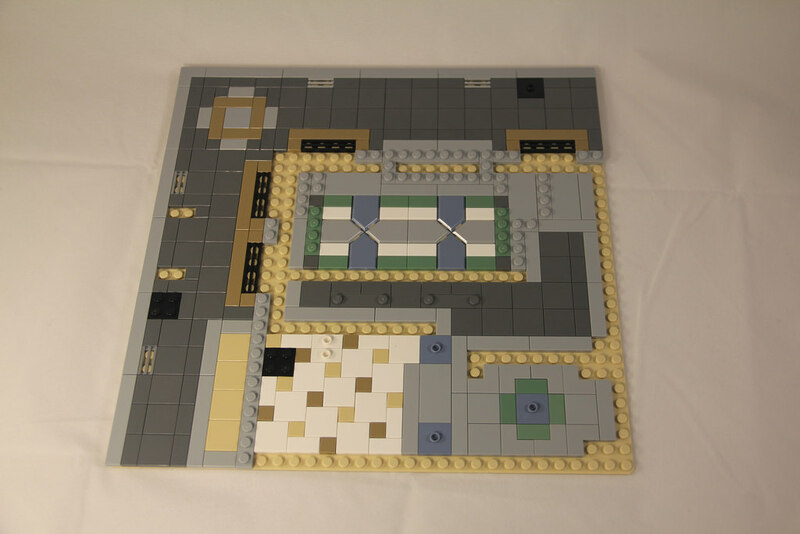 The baseplate is covered in tiles, with only the tiniest amount of bare baseplate studs showing. It’s one of the reasons why this set is so beautiful to me – there’s so much smooth tile! 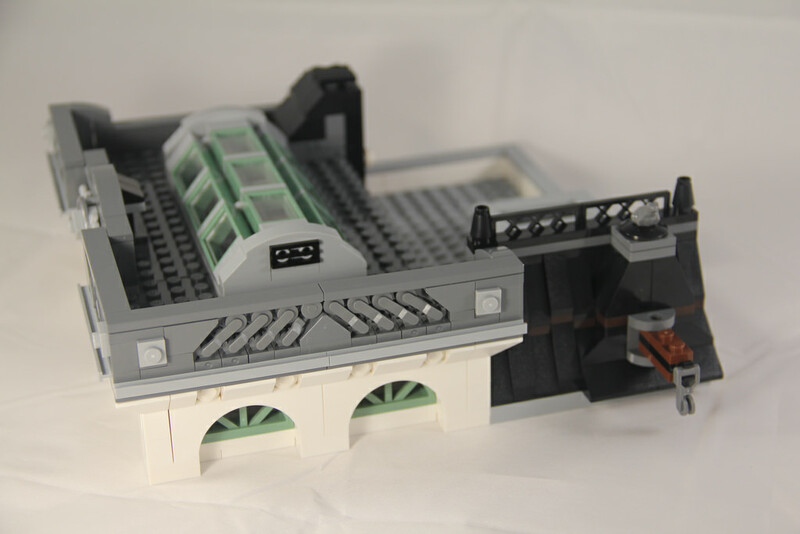 It also helps that it’s a corner build, so the building goes all the way to the back of the baseplate. 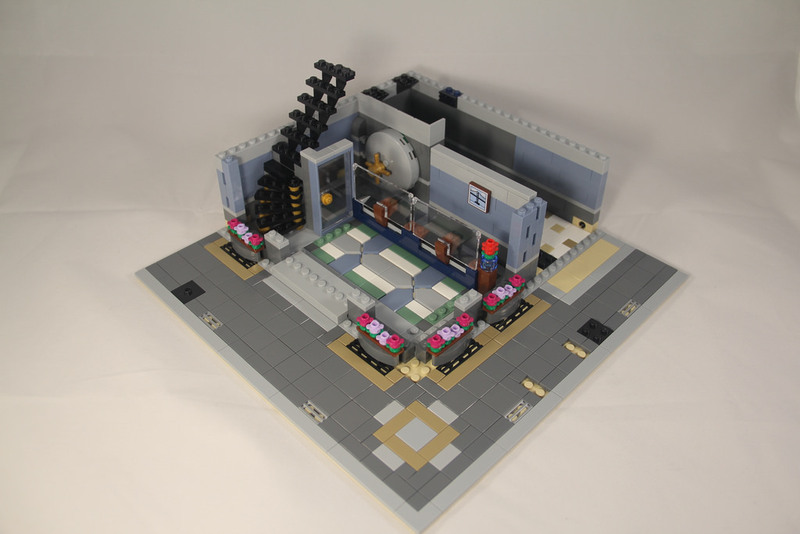 Modulars are one of the most entertaining sets to build, as there’s so much you can learn. 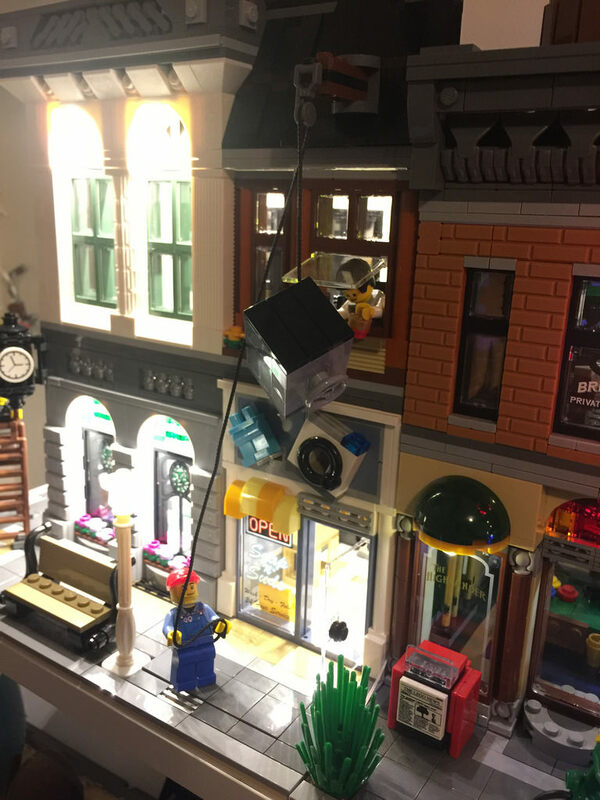 New techniques, new ways of looking at elements, and just the sheer enjoyment of seeing a modular building rise up from the baseplate. Not only is there a lot of tiling, but it’s detailed. There’s the checkered flooring of the laundromat (they’re 1×1 tiles, so tricky to get straight – I run the brick separator along them), as well as the beautiful bank foyer, using the Nexo Knights shields for detailing. The shield elements don’t quite meet neatly as they are bevelled, so some of the stud is showing between the diagonal edges, but it’s not too noticeable with the tan baseplate. The front verge and path are all identical to other modulars, so the path has a flow to it across all buildings. The upwards direction of the build starts with the back of the modular. 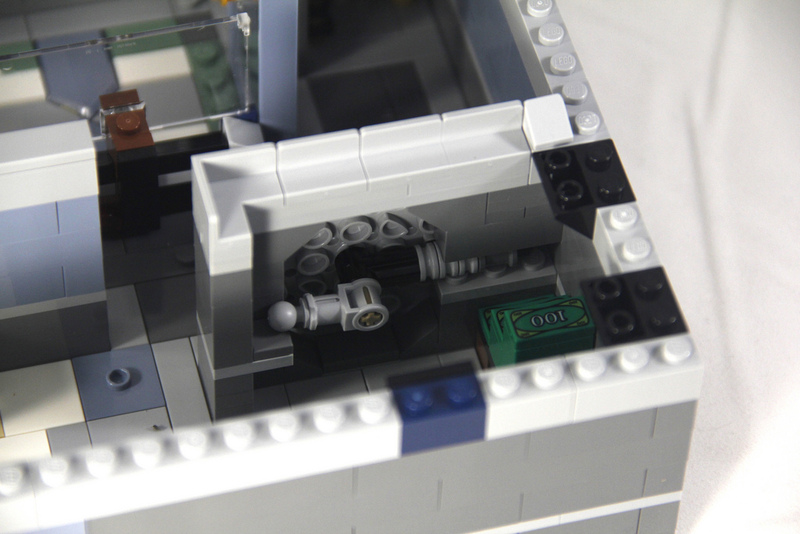 Specific details to look out for are the lockable vault door, giant stack of money, curved staircase (well, the start at least) similar to the process used in 10218: Pet Shop, and teller dividers using clear door elements. This is a brilliant way of creating security dividers, and it works perfectly – SNOT at it’s best. The front of the bank is also created, starting with the base of the wall and flower beds. The remainder of the work stays at the front of the building, erecting the beautiful front facade, complete with the highly detailed brickwork using the new 1x2x2 SNOT brick with 4 studs and the grey bullion parts. The printed window elements and stained glasswork goes in as well, followed by the floor capping. I think the designers have done a marvellous job in making a grey facade look interesting. Moving up to the first floor is next, but not before finishing the chimney stack. I wasn’t sure why this was done separately while building it, but it makes sense – in order to access the secret vault entrance, it makes it easier to remove a section of the chimney. The work on the first floor starts with adding some furniture. There’s the secretary’s workspace, complete with a very snazzy little espresso machine, and the bank manager’s rather imposing desk. It’s a beauty and makes use of the SNOT technique to a very clever way. There’s not too much else on the inside of this floor, as much of the floor is an empty void, to make way for the chandelier. This is a fantastic model and looks fantastic. I wish it could light up! The outside of the first floor is crisp white with large roman columns offset by light green windows. It’s very clean. Lastly on to the roof. The window at the top is very well designed, and very sturdy, with the model being finished off by the rest of the roof, and some furniture and the clock at ground level. I particularly like the use of the zipline handles as the greebling on the roofline, and the keys and shield. There’s also a fantastic change machine on the other side of the wall, inside the bank. The details in this set are excellent. 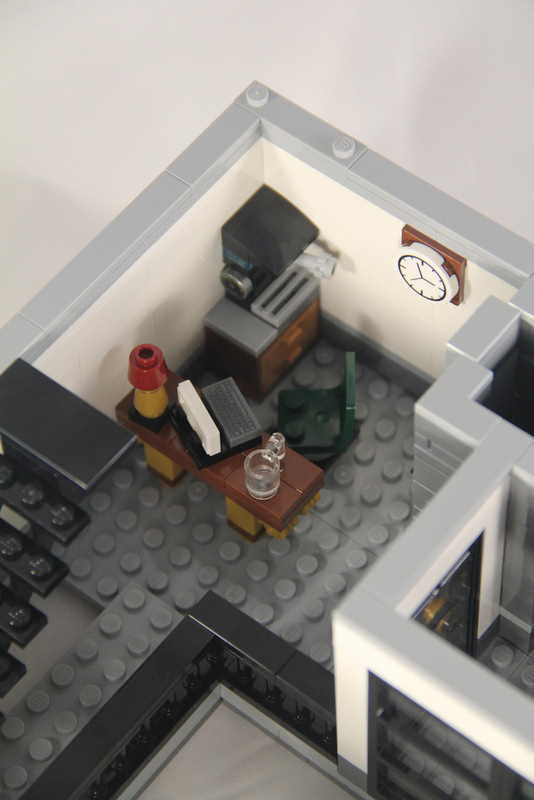 I’ve already mentioned the upper floor not having much on it, but there are still nice details, such as the wrought copper work on the secretary’s desk, and one of the best espresso machines I’ve seen in LEGO. One of my favourite things about the roof is on the roof of the laundromat. The hoist and roofline is beautiful and screamed for something to be done with it, so I’ve set mine up with a workman hoisting a new safe up to the bank manager. 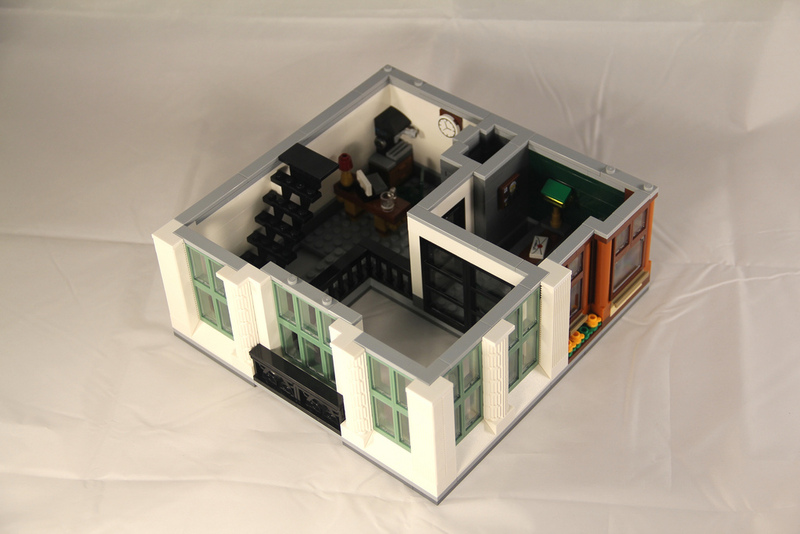 It’s not realistic at all, but it doesn’t have to be – it’s LEGO! ​One thing I will say that isn’t fantastic is that it’s not easy to get access to the vault area or chimney. It’s extremely tight in there, and so big hands, and even some kids’ hands will struggle to play. Apart from that, It’s a fantastic model, and one of the better looking modulars around. This is an easy one. 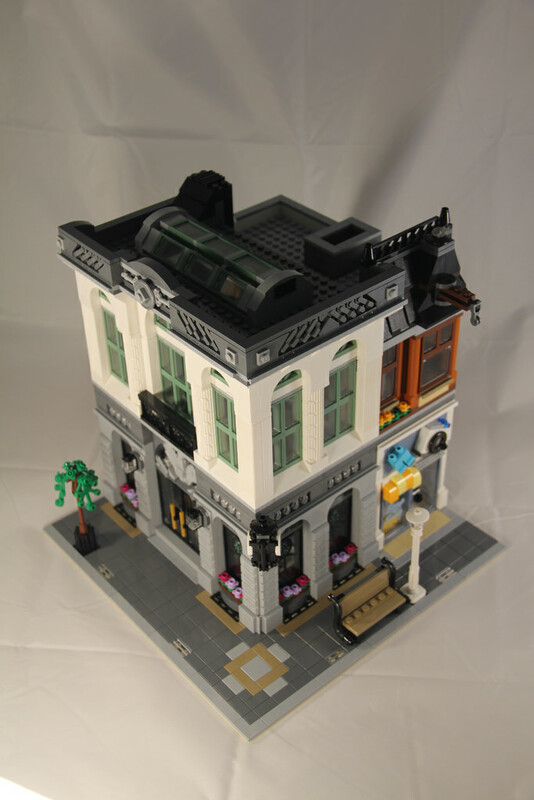 It’s a modular, it’s a rarer corner modular, and as I’ve mentioned before, there are some excellent parts. This is definitely one to get for the collection. 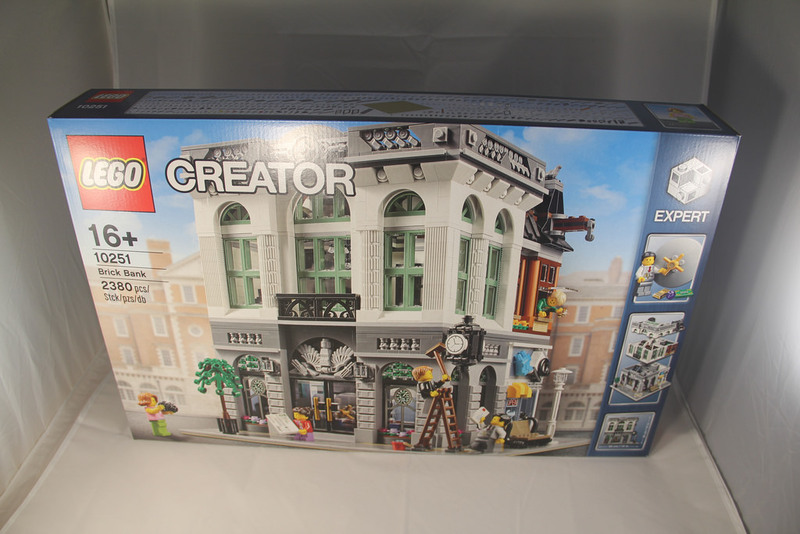 Next week I’ll be taking a look at a rather special set – 4000010: LEGO House – a very limited edition release only available from Billund, the home of LEGO! I’d love it if you me know what you think of the review. Where does this modular rate in comparison with the others?